Mizu's swaps - Engi no Jutsu - The Best Naruto RP on the Net! Jutsu Description: A genjutsu that requires the user to see the opponent and say the words, "I'm so alone." In that instant, the entire world beneath them crumbles, replacing them on two islands (or three/four islands, depending on opponent numbers, up to 5 islands, including the user) which are roughly 50 meters apart. The landscape is completely bare and the targets do not wonder why the islands came to be, they simply understand and accept that they did come to be. Suddenly, the islands continue getting farther away: by the end of the first post, they are 70 meters, by the second post they are 100 meters away, and by the third post, they are so far away that the user is nothing but a speck. In actuality, all the targets and the user are standing in place. In the even that the user leaves the island, the islands will slowly start to return together and after one post, the illusion is dispelled. This allows a chance for the user to escape in the remaining moments before the islands come back together. The user, once alone on the island, feels alone and sad. This is purely fluff, though. Note: The water can be water-walked on, but still, the water will move farther away, meaning, as he runs, the target is still running closer than had he not moved, but never getting anywhere closer. Also Note: The islands are 3 meters in diameter. Meaning free movement to an extent. Again Note: This is not a binding jutsu, per say. The targets can move, but might...you know hit their heads on a tree or something. This is visual impairment only, and feeling, if they choose to try and feel the water. They can move anywhere, and perform any attacks, though their aim will be off since they're like...70 meters away at least. They can run, though the distance they cover is so exponentially cut that it's as though they are standing in place. A leap forward 40 feet (if possible) would result in maybe a few inches moving forward. Final Note: Any offensive attack from the user that hits the enemy will dispel this jutsu. Last edited by merdle; 01-26-2008 at 03:15 AM..
You wanna try and Kai out of this? "You're forgotten," is all he says, but the second you hear the noise, it has begun. There he stands, a single man surrounded by nothing, in this blank expanse, the opponent sees his enemy, directly in front of him, chakra pouring out of him, oozing around in a circular vortex of sharp spears, curling on themselves, forming a giant web. It grows bigger and the heat of it is tremendous, seemingly supernova in it's temperature. Mist sears around the target, burning them, lapping at their skin with tongues from hell. The pain is horrid, monstrous. The closer a shinobi gets, exponentially more pain is inflicted, but there is no maximum range on the distance once it is activated. On the second post, the web grows bigger. Trees turn black, dead, from the squelching heat. The air shimmers into a hazy nightmare of steam. Nothing but extremely faint outlines can be seen against the white and red fuzz. The skin of the victim begins boiling. They can move, and try to escape, but it's in their mind, the illusion made real by their brain. OOC: Basically, it is a big, ultra, omega, super dump-load of a lot of pain, if you want your ninja to uber-pwn and get out of it simply by saying you can stand the pain, go for it, I'm not stopping you, but realize, this is a lot of pain. A whole lot. Uchiha Sasuke Chidori Rasengan Curse Seal lvl 2. Kyuubi lvl. 4 pain. Just don't god-mod because I couldn't word it to say it's a lot of pain. Every post it continues, is more pain, and though one would believe the receptors should shut down from so much onslaught, they never do, freshly screaming out to the body at every second. The entire body feels like it's being cut over and over, burnt and burnt, bleeding and oozing and dying. "Just wish for death," he often says. [The last part is just fluff]. Requires Opponent Permission or Death Enabled Thread. Note: Yes, I'm totally going for Stage Seven here. A childish jutsu, and effective to say the least, Ultimate Lasers capatilizes on fear present in opponents to produce the effect it aims to achieve. Upon hearing the words, "I'm Charging My Lasers," the opponent see the user charge an exceptionally vast, almost unlimited amount of chakra into a big, round, blue ball. The ball then explodes outward in a huge beam of pure chakra. The beam aims to rip apart the user and no matter where he runs, the beam finds a way to hit (If the genjutsu is activated of course). There is an exceptional amount of illusory pain that lasts the duration of the jutsu, and the beam can leave illusory burns and deep gashes along the target's body, though they dissapear after the end of the jutsu. The target can still fully move, of course. 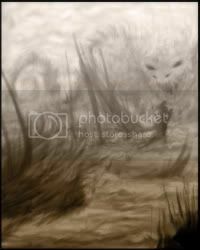 Triggered by a short series of seals, the target will suddenly see his world go fuzzy in a shroud of blue and white. It is a very peaceful world and many a shinobi have been known to feel at ease, though it in no way forces any emotion on the user (as that would break the rules and such). At the most serene of moments a ear-splittingly loud shriek is issued, usually curtling blood and scaring the hell out of anyone. A giant monster appears from underneatht the user! His claws latch into the opponents face, ripping his skin off the bone completely, leaving nothing but his eyes, teeth and skull left as he watches his face being dragged on the ground, blood gushing from his giant wound. Nausea usually ensues as exceptional pain rockets through the area. If that wasn't enough, after one post of face-ripping, and just when the user is beggining to sort through the mess he is currently in, another claw reaches up and rips out his eyes, severing the ocular cords slowly and bluntly. More pain. The claw also digs into the brain. The second that is over, however, the genjutsu ends, meaning the maximum duration is two whole posts. Last edited by Mizu; 07-14-2007 at 01:30 AM..
Jutsu Description: Another one of Kagenmi's Engrish jutsu, Riipurru causes a ripples to be sent along the chakra wires connecting master and puppet. The puppet soon begins to vibrate incredibly fast. The side to side movement of the vibration does not allow it to mysteriously dodge anything, and if something was aimed at it's center, vibrations wouldn't make it shift and miss. It's still a pretty big target. The vibration comes into effect when human eyes watch it. Moving the puppet side to side can cause some confusion, and moving forward and backward could be a little more difficult to ascertain. The vibrations make the puppet look as though it were moving in jerky disjointed attacks. Imagine a hummingbird, it flaps fast, but still stays in the same area, but you can't really tell where its arms/wings are. This isn't that fast. Unless stated otherwise, all ninjutsu here are created from nearby plants. This is for my upcoming Hensou Otosui Mizumaru. A inventive jutsu from Mizumaru’s personal research on animals, this jutsu calls upon the life-force of the planet in creating new life. Mizumaru throws seeds, which become raccoon dogs, swift and violent. The Nyctereutes Procyonoides then charge at a single opponent and aim to bite and claw them. The dogs can cause moderate damage but disappear into the ground after a single post of group attacking. 1 canine is created for every 7 Control are created. Three rather large mice jump out from the ground at different areas, zipping toward the target, they weave and climb buildings using chakra, capable of running on walls and not slipping. They converge on the target where they explode with the force of an exploding pouch each. The entire time they squeal a very loud and nasally “Chu!” that could serve as both a distraction to the opponent and a warning sign. The Megadontomys Cryophilus explode if hit before they reach their target, also, they can be reflected because of their tremendous speed, meaning if they are somehow blocked by a defensive ninjutsu or shield, it is entirely possible that they could bounce back off the shield on a return trajectory and explode. They leave no blood or gore after their explosion. They can last 2 posts at most, but if they can not reach their target, they explode after their maximum duration. During Mizumaru’s research on chameleons, he ran into an interesting ninjutsu discovery. By biting a seed and releasing the chakra, he is able to emulate the Chamaeleo Balebicornatus. He shrouds himself in his surroundings, staying perfectly invisible as long as he remains perfectly still. The only problem is that by breathing, his chest moves, sending a heat distortion type effect near his chest. The distortion is hard to notice, of course, but any more movement than breathing shakes the ninjutsu free. His shrouded state can be held for 1 post for every 10 power. The ghost-faced bat was an interesting creature for Mizumaru to study. Having the characteristics of standard bats combined with a fear-imposing look of spirits, the bats were categorized as “tempermental.” This skill creates vines from the earth with bulbs on the end. The bulbs open to reveal a Mormoops megalophylla, each tethered by their tail to the vine. They fly towards the shinobi from all sides, attempting to bind them. If they bite or touch the opponent, the vines quickly wrap around the enemy, seizing them and holding them down. Those with a base strength that exceeds the users Control can often escape unharmed, though any weaker and they find themselves bound for 2 posts. The bats also bite, drawing blood, for a single post after catching the victim. When Mizumaru is attacked, he can quickly replace himself with a Sarcophilus harrisii, a vicious Tazmanian devil that happens to look traditionally cute. The replacement animal will then attempt to scratch and cut the opponent who attacked Mizumaru. This happens by Mizumaru replacing himself with vines nearby and a seed. The seed, a catalyst for his skills, then erupts into the Tazmanian devil which can only exists for 1 post before disappearing into the earth. Can only be used twice per battle and follows traditional Kawarimi rules. Tazmanian Replacement counts as a Kawarimi. A non-animal intensive jutsu, Call of the Beast focuses entirely on the nature way to strike fear in an opponent. After biting on a seed, thousands (though it is only about 10 or so) of vines shoot from Mizumaru's hole in his mask and launch forward toward the opponent. The vines are not exceptionally fast, but as they travel, each vines makes a distinct animal noise through the buds at the end of the tubes, loud and tumultuous, creating a very hostile sounding environment. Most shinobi would find themselves distracted, as the roars seem to be coming from all sides. The vines, upon reaching the target, will strike out like blunted weapons for moderate blunt damage. The first truly murdering technique created by Mizumaru, Preregrine Shot takes a kunai and coats it in his chakra, essentially transforming it into a falcon. The Preregrine Falcon is a marvel of nature because of it's ridiculous speed, in fact, in a dive, the bird is capable of attaining speed that over 200 miles an hour. This jutsu capitalizes on that speed. After a post of hovering, the kunai vaults downward, the hawk silent as can be. If it hits the opponent (and it usually does because of it's speed) it leaves big, messy, holes and lethal damage. The jutsu is created by having Mizumaru focus chakra on his hand. The algae forms, covering his hand with a slick slime. If the algae comes in contact, these symptoms can happen in the following posts. If the enemy is inflicted, on the following post they will feel nauseous. If they throw up, the symptoms are cancelled, but if they maintain their dizziness without vomitting, the nuerotoxin advanced on the next post. If they still do not vomit (bloody vomit, this time) they become extremely sensitive to light, sunlight feeling as though it was burning through their skin. After that comes muscles tremors and convulsions on the next post. This nuerotoxin, specifically created for battle, requires chuunin or higher medical attention or it can kill after 10 posts, whether the opponent throws up or not. The Algae can be maintained on his hand for one post for every 4 Control. Requires opponent permission or a death enabled thread. Mizumaru researched the noxious week Tartary Buckwheat in his quest to identify every plant and animal ever known, a quest he is still working on. The buckwheat is a noxious weed because of its extreme rate of reproduction and its invasive, almost parasite method of growing. The introduction of Fagopyrum Tataricum creates a dozen or so small spears of the buckwheat, hardened by chakra, capable of cutting like a wakizashi. On the next post, the blades of weed double in numbers, surrounding the opponent with sharpened plants that stay stationary. The third post, it double again to a staggering 50 shafts or so. Each staff retracts when the user gets too close to it, but pops right back up once the user leaves. The battlefield is taken over by this skill for 5 posts, doubling each time until it simply vanishes. The life-cycle of the buckwheat is short, and as such, the jutsu can never be extended longer than it’s set duration. 50 shafts of buckwheat can be spread a maximum of 4 square meters. The area double with the amounts, as well. The shafts can grow underneath opponents, though the ground tremors very specifically, which alerts most decent shinobi of the spears' presence. The noxious weed is also noted for its durability in harsh climates; it can not be simply cut through or punched out of the way, each strand is about as strong as tempered steel. Mizumaru sticks his hand straight into the ground, pulling out a very large Bauhinia variegata L, a noxious weed and tree, one that grows exceptionally fast and provides a sturdy trunk that can stand up to severe windstorms. The tree can block a single taijutsu of base strength 20 or less, or any linearly attacking ninjutsu before it wilts dramatically, crumbling into dust and sinking into the ground slowly. The lifespan of the Mountain Ebony is very long, however, as it can be summoned once more in the same thread. The noxious tree is also quite wide, reaching a width and depth of (Power + Reserves /3) in feet. It lasts a single post before crumbling to the ground. And yes, it does look amazing to pull a ten foot wide tree from the ground. Last edited by merdle; 01-26-2008 at 03:57 AM..
Jutsu Description: A simple ninjutsu technique. Upon imbuing chakra remotely into a corpse, Sarasu can initiate the body to temporarily reanimate, forcing it's throat to seize up and scream the loudest it can in a grimace of death throes and pains. Upon finishing the scream, it "dies" once again quickly, becoming silent and nothing but... a corpse. Jutsu Description: The corpse suddenly reanimates, just for a second, instinctively reaching out for the target. If he's not in reach, the arm simply flails for a while before it "dies" once again. If he grabs, depending on the strength, the user can influence the corpse to keep the target held, but since it's a corpse, a single hit will usually snap off the fingers, arms, or other bodily parts. Corpses are pretty weak, actually. Last edited by Mizu; 02-18-2008 at 01:49 AM..
Korede: Korewa no Enjintou Dachi! Here: This is my Scalpel! This is Sarasu's only ranged attack. After living as a pure medical shinobi, he found that the time it took to master controlling human remains took too long, so in a pinch he changed his focus, learning to control his chakra in such a way to manipulate his own medical tools. Some may call it the medical tool summon skill turned offensive... Sarasu just calls it "My Single Scalpel Summon Skill." After a single seal, Sarasu sends his chakra in the ground, summoning a single giant scalpel blade (3 feet) to emerge from the ground. It stands straight up, is very, very sharp, and usually cuts through human legs and such with as much ease as a regular scalpel. It's a very dangerous skill, and best used in combat when the opponent won't notice the very subtle shift of the earth as the blade emerges. 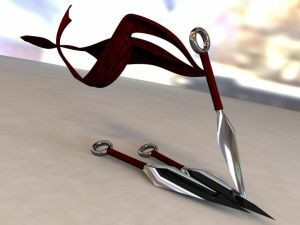 It's a single blade, it can't move, and it can't be manipulated in any way by Sarasu or anyone else. The single target must be within eyesight and no more than 20 meters away. -The blade is like a big lance coming up from the ground... like, not is. -It's 3 feet, nothing crazy. -Disappears after a single post. Attack, then gone. -Can not be physically manipulated (to avoid Sarasu metagaming a field of scalpels, lolol). Last edited by Mizu; 04-04-2008 at 03:32 AM..
Jutsu Description: A little odd, Alpha Null is an infinite set only because of the items used. Cleaver swords, maces, flails, bo, tessen, katars, scythes, and a flurry of other seemingly extraneous and outrageous weapons fly from the scroll toward an opponent. Their numbers are less than a traditional technique because of the equipment size, but the damage is much more severe, of course. These created weapons immediately disappear after the jutsu, and can not be used as the weapons they are outside of projectile jutsu. Jutsu Description: Torus, a doughnut shape, is obtained by maintaining a circle in three-dimensional space about a line, which does not intersect the circle. Haide took this in his jutsu creation to create a doughnut shape of kunai around him. The halo of projectiles becomes dense and serves as a deterrent for taijutsu, since the spinning doughnut of projectiles (with Haide in the center) could cut through flesh with its momentum and sharpness. The Torus lasts 3 posts maximum and moves with Haide, who serves as the non-intersecting line. Jutsu Description: A perfect trap, two projectiles are seemingly thrown at random, but they serve as the two beacons, sending a small chain upwards to connect with the nearest surface (tree, roof, etc). These two lines are now the launching point of any kunai Haide wishes for the next three posts, meaning the kunai launched from the chains travel directly across, acting as a transversal agent between the two chain lines. This means that from either of the two lines created by the Kunai-chain combination, 10 kunai may be launched. The kunai travels in a straight line until it hits the opposite side. The beauty of the technique is that the kunai travel at a faster velocity than Haide's thrown speed. After the technique ends, all weapons disappear in a silent plume of smoke. Last edited by Mizu; 09-05-2008 at 02:39 AM..
Jutsu Description/ Trigger: After the Maseika makes physical contact with an enemy or friend, Kyo can channel his chakra and pull them into the Twilight, an illusory metaphysical coalesce of the fourth dimensions. Most clan members have been unable to literally enter the fourth dimension, Kyo found his alternate to the real thing through a genjutsu. In the Twilight, the world is shadows and blued, smokey and filled with darkness, though everything is the same, if not buzzing and systematically pulsing in arrhythmic beats. They enter in the same position they were in the third dimension, though they can see their variations frequently changing, doing something different from their time-path. In the Twilight, time seems to pass twice as slowly as the third dimension. There are seemingly no other humans present, though their variations are ethereal and haunting, like human echoes running wildly, entering and exiting the Twilight with each passing second. Once the people in the Twilight move past farther than their original perspective, details and landscapes becomes shadowy blues that contain no features at all (as they can't perceive what they can't perceive). To illusion also extends to anyone watching: the two bodies have completely vanished off the face of the world. Of course, if someone was approaching, the user and target could see the people approaching through the Twilight, faintly. The illusion ends the second the invisible "Twilight"-goers are touched or injured. Though their bodies are ripped from the third dimension suddenly, the emerge just as suddenly. At the end of the technique, the affected and the Maseika are returned to their exact position. No damage incurred in the Twilight genjutsu carries, though loss of consciousness could be possible because the mind makes it real. Kyo, however, can not attack while in the Twilight. No damage is transferred. If someone somehow got injured enough in the Twilight, they could potentially faint, "re-appearing" in the real-world unconscious. The exception to this would be healing techniques, which can be performed in the Twilight. In the event a third person is taken into the Twilight with Kyo, the technique lasts nominal duration of one post maximum (though minimum durations still apply). Because of the illusory aspect of it, though they seem to be completely spirited away, they are incidentally enough standing exactly where they were prior to the techniques use. Last edited by Mizu; 01-23-2009 at 05:30 PM.. Description: After amplifying his chakra through his nodachi, the sword creates chakra compacted steam which trails behind the sword, a white ribbon of water. The beauty of the technique is that a fist sized trail traces the sword's tip's every move in the air. The steam hinders vision slightly (as steam is dense), but only where the trails block. When the user wills it, he may push out with his hand, scattering the trails of chakra-steam to shoot from the epicenter, dousing the opponents in thick streams of his highest level steam. This is a post-by-post jutsu. Description: This ninjutsu is the epitome of what can be done in Steam manipulation. The user performs a long string of handseals and amplifies his chakra through his nodachi, which vibrates and hisses, steam emanating from every section of the blade. The steam gathers around the user and target, covering an area of 40 meters. A main portion of the steam is then controlled, rushing forward in a feral feline's mouth to burn, tear, and destroy opponents. In the event the user wishes to, he may split the steam into two amorphous clouds of steam that may attack with lessened damage. The primary steam carries the highest burning potential the user has, as well as the ability to slice into flesh much like blades. It may only be initiated once per thread and after its use (whether it be one post or two, jutsu uses provided) leaves the user unable to perform any other sword related techniques, nor use any ninjutsu or genjutsu a genin would not be able to. In the event the opponent opens his eyes, ocular damage is known to have arisen. Unprotected eyelids blister, however. Trigger: Hearing the user say the technique's name. Description: Once afflicted with this illusion, at the behest of the user, the target will be caught unawares and hit by an illusory ball of compacted snow once per post for the duration of the technique. The snowball causes minimal pain since it's just a snowball. The target, and not the user, specifies where the snowball hits, when it hits, and how it hits since it is taking place in their mind. Trigger: Sensing the user pointing at an object. Description: After an illusory "charging" of an item, the target will sense that a specific object (not on their person at the time) is extremely cold. If the object is picked up or touched, it will create illusory pain and trick the brain into responding as though the item were very cold. If the target holds on and endures, the illusion is broken. The target might pick up and drop the cold object repeatedly, if they are not savvy. The object must be a "specific" object, not the ground or a patch of air. Trigger: Hearing the user scream. Description: The user completes hand-seals and screams. Illusory spears of perfectly clear ice jettison from the ground, skewering the air a few times a second. The spears will never hit a moving target, instead piercing close by, or where the target was previously. The target can only be hit if she stands still. If the spears hit the target, they cause illusory pain akin to taking a sword in the belly. This has no other effects. Trigger: Physical contact with the user. Description: Upon contact with the user, the target will be tricked into thinking that contact with the user causes frostbite and damage to their body by ways of exceptional cold. The frostbite is localized to the points of contact and while the ice that grows on the area lasts the duration of the genjutsu, the intense pain of the genjutsu's duration remains faintly as a reminder. Last edited by Mizu; 05-24-2014 at 08:01 PM..
First Aid is Koushou’s first line of defense when out in the open. Leaves, grass, or debris swirls around and forms two semi-translucent panels in front of Kou, who can quickly tap symbols and summon medical equipment. The equipment must be physically located at his home clinic room and can only be basic medical equipment like gauze, syringes, pain medications, droppers, bandages, and such. Stage Two Effect: Larger medical items like crutches, braces, and wheelchairs can be summoned.